Sometime around two years ago one of my very favourite food industry journalists - Melanie Warner - disappeared. Her articles stopped appearing online, and her Twitter feed went dark. I’m not sure how long it took me to notice she was gone, but when I did I reached out to find out if she was ok, and she wrote back that she was working on a book about the food industry – a fact that took some of the sting away from her disappearance. 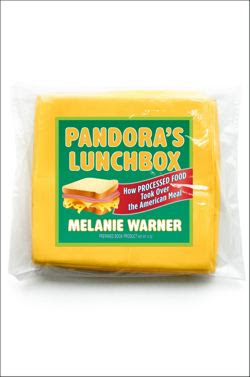 Well here we are, two years later, and next week her book, Pandora’s Lunchbox: How Processed Food Took Over the American Meal, is set to launch and Melanie kindly sent me an advanced copy. The book’s fascinating. While other books have been written highlighting what I see as the tragic decline of actual food in North America (Fast Food Nation, Food Politics, The Omnivore’s Dilemma, and more), rather than focus exclusively on fast food, or on Big Food’s political shenanigans, or on how-to fix what’s broken, Warner does all three with her lens focused on the history and science behind the industrialization of the food supply, and in the process, highlights some of the health problems and unknowns that are uniquely consequent to the way our land of plenty got that way. Warner reports that her interest was piqued consequent to her tremendously odd processed food collection – a collection she started to satisfy her desire to see how long beyond a processed food’s printed best before date that food would continue to be edible. From 9 month old only slightly brown around the edges guacamole, to 2 year old somewhat shrunken and crystallized processed cheese slices, to cereals older than 2 of my children that still look and taste like new, to chicken “nuggets” that rather than being immortal, liquefied (rather than rotted) within 10 days, Warner set out to figure out why. Her book explores the history of some of the food industry’s biggest sellers: “Eternal” sliced cheese and the mistake that led to its creation; processed cereal and the story of a man who bragged that he never consummated his 40 year old marriage; discretionary fortification of foods and how and why your milk might contain extracts of sheep wool to return to it some of the vitamins stripped clean by the unbelievably harsh world of processing; the growth of soy and a tale of food flavourists and the debate over omega 3 and 6 ratios; whether or not there is such a thing as a healthy processed food, and much, much more. Warner attributes her interest in food to her mother Therese who both accidentally ate the 9 month old guacamole (without negative effect), and also instilled in Warner two important messages, “What you put into your body matters, Melanie”, and, “Just because it’s edible doesn’t mean it’s good for you”. Warner isn’t as merciless in Pandora’s Lunchbox as I’d seen her be before she went dark and I wouldn’t be at all surprised were I to learn that her editor, or the legal team over at Scribner, had her tone her message down some, but mercy notwithstanding, the book’s fantastic and fascinating and while she doesn’t spend too much time on it, she certainly gives us her prescription for how to stay safe in a land full of more than 5,000 food additives. She calls it a "new food ratio" and I think it’s a great one. Riffing off of the industry’s seminal BS, “Everything in moderation” Warner applies it to processed foods and suggests that if processed foods made up 30% or less of the average person’s diet, that person would be doing pretty well indeed.